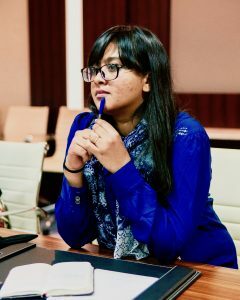 Ruchi Kumar is an Indian journalist currently working in Kabul, Afghanistan, focusing on news stories from the Af-Pak region. She has been published in Foreign Policy, Guardian, NPR, The National, Al Jazeera, Washington Post among others. After four years as a journalist in India, she moved to Kabul looking for different stories to tell. Initially, she worked on a US Embassy funded online citizen journalism platform in Afghanistan, but stayed back for the many stories Afghanistan has to offer. Having worked majorly in the online media, she specialise in digital and multimedia storytelling. In India, she worked two years at the Times of India, one of India’s largest media houses, juggling between print and online. Later she moved to Zee Media as a web producer for their print property DNA (Daily News and Analysis) working on politics, especially the parliamentary elections of 2014 in India. She has some experience working in development sector—specifically, in child rights, and is a post-graduate in Human Rights from the Indian Institute of Human Rights.